October 14, 2017. 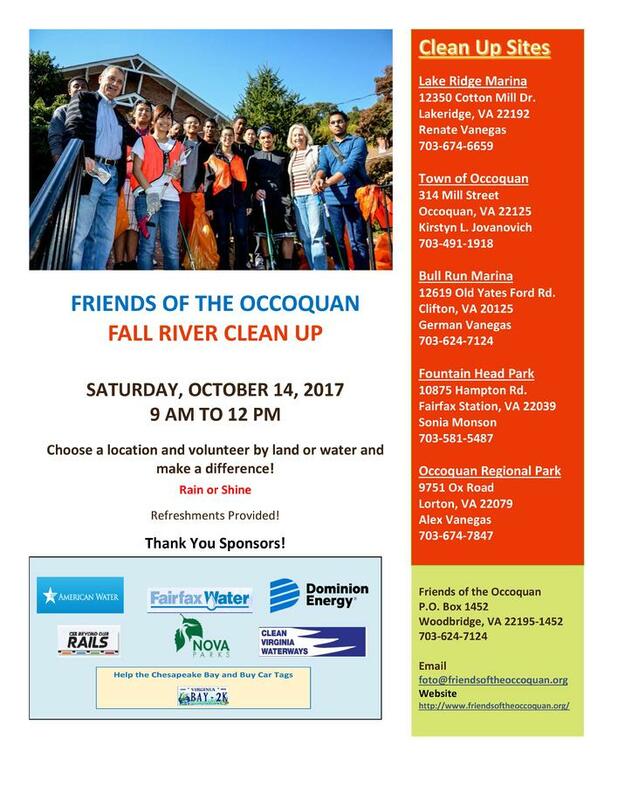 Comfortable fall weather brought out 212 loyal FOTO volunteers in full force to relief the scenic Occoquan River/Reservoir of 2 tons of trash from both the water and the shoreline. JROTC of Woodbridge High School, Boy Scouts , Penn Elementary School's Stem Class, Air Force Recruits, SEV1Tech, Manassas Rotary Club, Osbourn Eagles Interact Club, Optimist Club, Marymount University students and many families cleaned up at all sites in Fairfax & Prince William County & the Town of Occoquan. Among the 158 bags of trash, 40 bags of recyclables, there were also 6 tires, hubcaps, car radiator, 2 radios, 1 play station, 3 chairs, pipes, boards, foam pieces, buckets, oil cans, nest and fishing supplies and other materials collected. Special thanks go out to all the above mentioned volunteers and Park Manager Mike Tiller who disposed of the trash that the 146 Lake Ridge Park volunteers had collected, as well as Kirstyn Barr Jovanovich, Linda Murray, Renate Vanegas & Estrella Vasilescu who manned the signup stations. Thanks to Comcast TV's Liz Lockhart for the video and photos! More pictures coming soon.